The National Chairman of the National Democratic Congress (NDC), Dr. Obed Yao Asamoah, has dismissed the assertion that Prof. John Evans Atta Mills, the party's Presidential Candidate, was not his own man and that the ex-President, Flt. Lt. Jerry John Rawlings, was controlling him. “As regards questions of whether Prof. Mills would be his own man, I think that he is a victim of the statement he made in the year 2000 that he would consult ex-President Rawlings 24 hours a day. It is like the kind of things that Mr. Victor Owusu suffered in the past when he said that the people of the Volta Region or the Ewes were inward looking. Speaking to The Chronicle in an exclusive interview last Friday on various issues including how Prof. Mills statement of consulting the ex-President 24 hours a day would affect the fortunes of the NDC, Dr. Obed Asamoah stated that Prof. Mills was not somebody that could be pushed around. He said he believed that he would be his own man and he would be objective enough if the ex-President had some contributions to make, because he had been in government and had been the head of state for almost two decades. 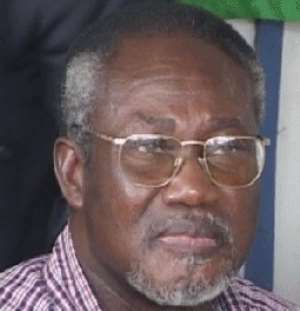 In the heat of the 2000 election campaign, Prof. Mills, on being elected the NDC flag bearer, said that he would consult the ex-President 24 hours a day on various issues. This statement did not go down well with anti-Rawlings elements and more especially the New Patriotic Party (NPP), who have since held that against him that he would not be able to rule the nation without the influence of Rawlings. As the 2004 elections draw near the issue of whether the former law professor and Mr. Rawlings' vice president, can exercise authority without the shadowy hands of the former president, has reared its head again. But the national chairman of the NDC and Prof. Mills' former law lecturer said Prof. Mills had demonstrated to the people that he was capable of handling the affairs of the nation. His responses to various issues including his recent state of the nation's address attested to this. “I think that even in the year 2000, the choice of running mate from all indications was largely influenced by him”, Dr Asamoah said, referring to the very unlikely choice of Mr. Martin Amidu as Prof. Mills' running mate. Consulting people including the ex-President, Dr. Asamoah stressed, did not mean one was not one's own man. “Of course nobody can claim to be perfect or an expert on all matters,” he pointed out and added that with the positive developments in the flag bearer's output, he would improve and come out even better when he officially launched his 2004 campaign.